We’re going to the New England District Championship! We learned this week that our ranking at our two district events and our points for winning the Entrepreneurship Award at the Central Mass. District Event at Shrewsbury have moved us on to the next level of competition. 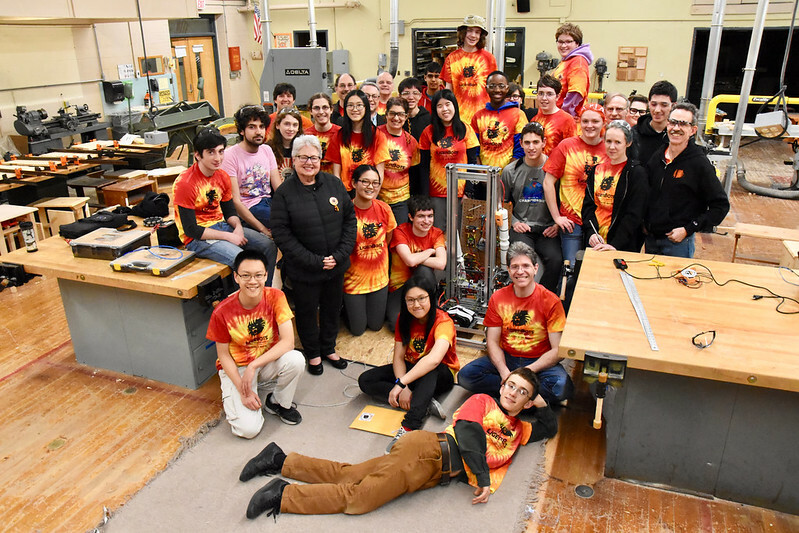 Our robot, Thanos, will accompany our entire team to the athletic center at WPI to compete with and against 63 other teams from around New England. All of our supporters are invited to join us in the stands to cheer on our team! Here is the schedule of events. Much of our attention this week went to improving the code for our robot, planning a visit by one of Newton’s state representatives, and doing outreach at a local elementary school science fair. The LigerBots with Massachusetts state representative Kay Khan. On Monday, we hosted Massachusetts state representative Kay Khan, who represents Newton, at our Newton South workspace. 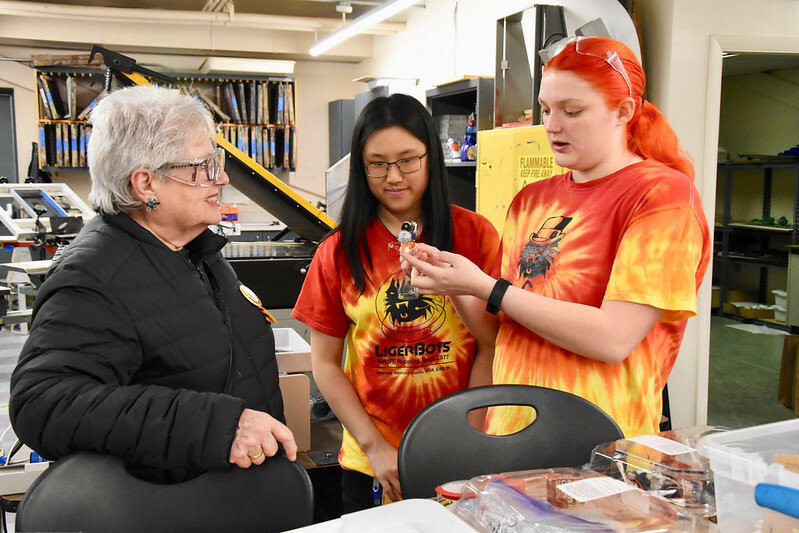 We showed her our 2019 robot and our ongoing technical and marketing projects, including button making, brush bot repairs, and robot CAD, and we talked with her about the importance of FIRST programs as project-based learning. Team members ran a video of one of our matches from the SE Mass. 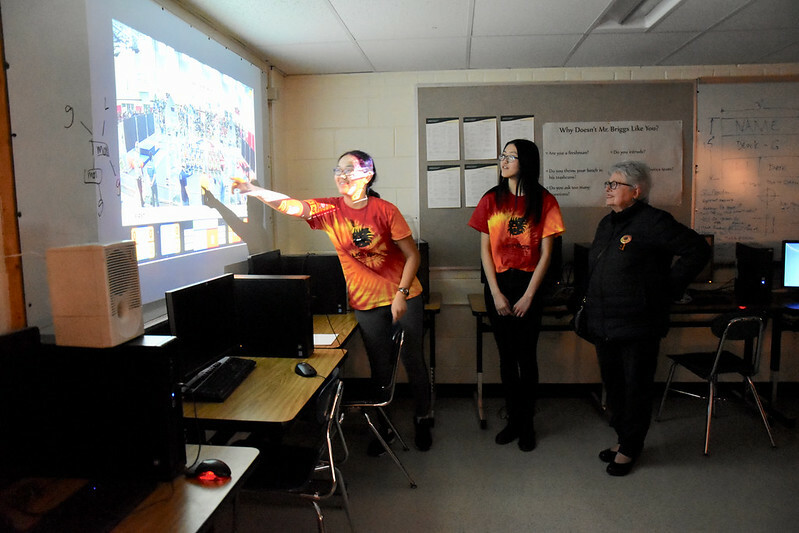 District event at Bridgewater, while explaining the Destination: Deep Space robot game. We are eager to continue our relationship with Rep. Khan, and hope that she will be able to advocate for FIRST programs in the state legislature. AJ and Samy show Massachusetts state representative Kay Khan our brushbots. Gideon explains our robot CAD to Rep. Khan. 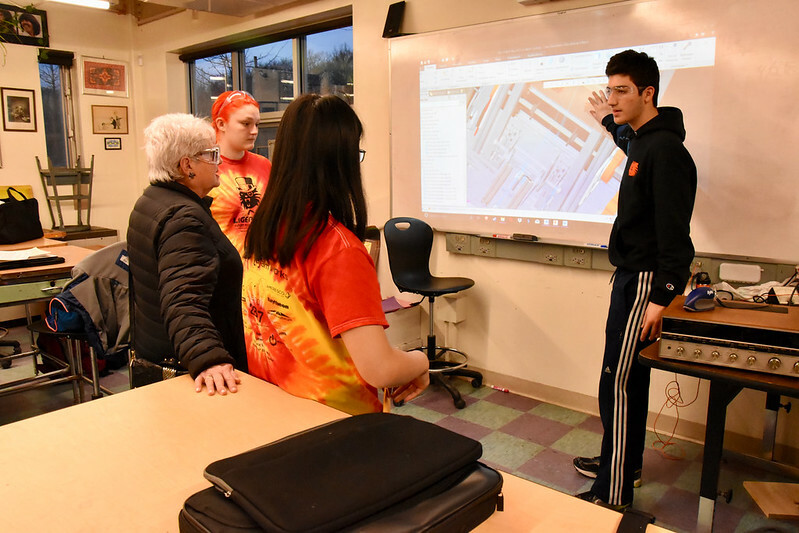 Amanda explains the 2019 FRC robot game to Rep. Khan. 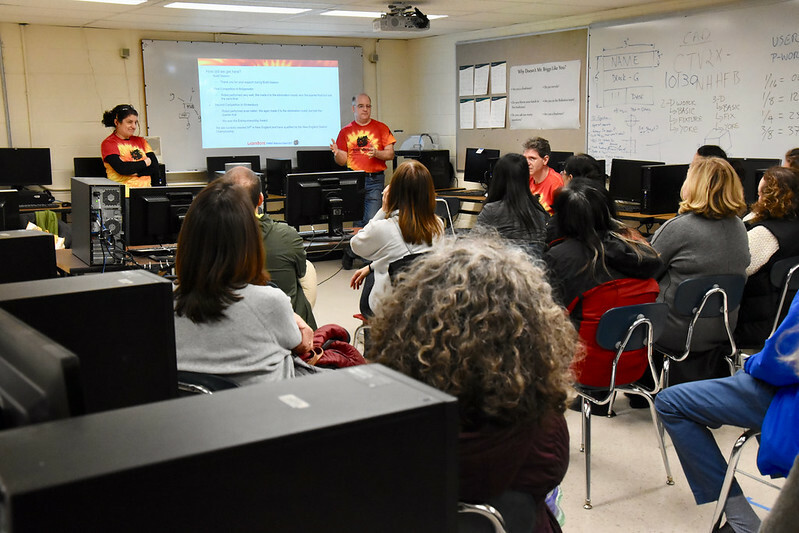 Later that same meeting we held an informational session for parents about what our plans are if we do well at the New England District Championship and qualify for the FIRST World Championship, April 24-27. Our head coaches gave a presentation about last year’s experience, and described the next steps in the logistical and fundraising process for getting our team to Detroit. Co-head coaches Noa Rensing and John Fitzpatrick present information to LigerBots parents about the process for getting our team to the World Championship. 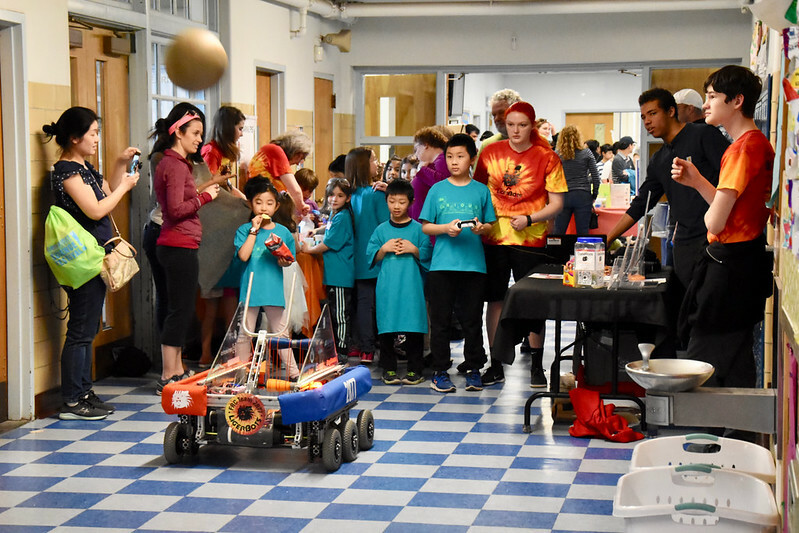 Last weekend LigerBots did outreach at the Bowen Elementary School science fair, which was mobbed with people on a warm spring day. We brought our 2016 (demo) robot, which sported a new ball-throwing arm designed and manufactured by our students. We also brought the ingredients to make neon-colored slime, one of our standard STEAM outreach activities for kids. Bowen’s students eagerly ran up to our table, excited to get their hands dirty. They followed the recipe we provided and modified it to achieve the perfect level of stickiness. We included the science behind slime on our recipe sheet, and the kids took a copy home with them so they could fully understand the slime process. 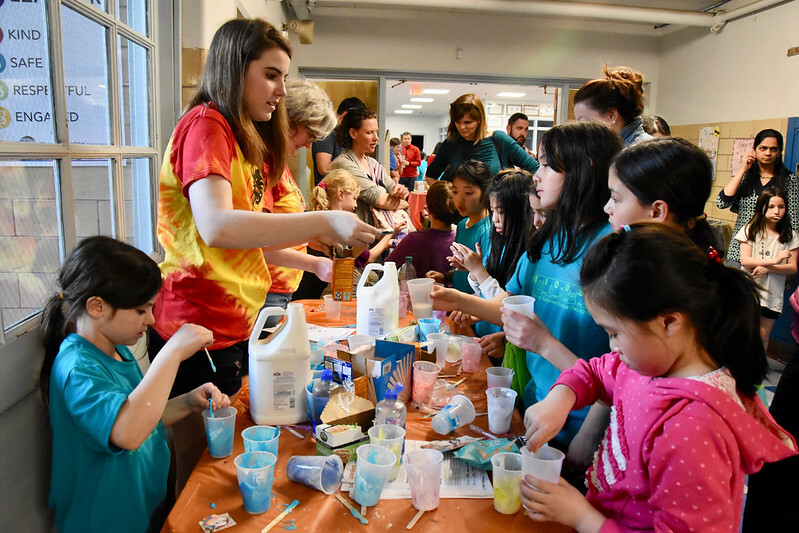 Carolyn helps visitors at the Bowen Elementary School science fair make slime. In addition to our STEAM activity, we also showcased our 2016 robot. We taught kids how to drive the robot and make it shoot a soft orange ball into the air. A crowd of children formed to see who could catch the ball when the robot shot it. The ball often went over their heads, and they laughed loudly as a result. Their parents showed interested in our team, and we gave them handouts about the LigerBots and FIRST programs. « Come Watch Us Compete at the NE District Championship!